This upland country, half way between the mountain tops and the valley floor, is an abundant mix of topography, forest, plant and animal diversity. The land rises to open, sun-filled ridgelines only to plummet, in the space of a couple of hundred yards, into deep and dark ravines cut by the endlessly streaming clear water tumbling between the rocks that are sometimes as big as a car. In between are the remains of old upland meadows marked by meandering stonewalls that show us the patchwork patterns of the old farmers, you can read how they used the land and often scratched to make a living. 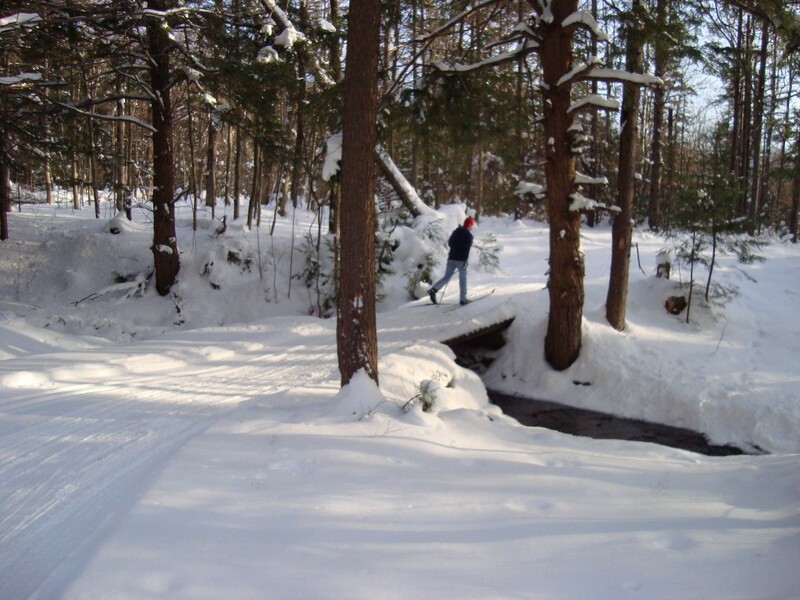 From Cobble Hill, about a fifteen-minute ski or walk from the Farm, you can view the Adirondacks in New York State, Mount Mansfield, the city of Burlington, Lake Champlain and vast tracts of mountains, lakes and farmland. Living in this upland region are bear, deer and the occasional fleeting bobcat, waddling porcupine and wandering moose—often seen with a mouth full of dripping grasses. You can surprise a deer, and yourself while spotting the tracks of rabbits, small fisher cats and many other woodland critters at home in these hills. In winter and summer the bird diversity, encouraged by an active bird feeding and habitat development program at the Farm, is spectacular and highly visible. As many as twenty different species of trees grow in this region, varieties ranging from the uplifting boughs of the graceful sugar maples to conifers forming dense clumps of green, brown and black. On the North East corner of the Commons is an mature hardwood stand that could be developed as a Sugarbush or selectively harvested for building purposes. Near the farm is a Norway spruce plantation, planted by depression-era CCC workers, that conveys a feeling of a traditional European forest. Adjoining the spruce forest are many examples of first growth woods taking over old pasture, where the fast growers, like the ubiquitous poplar, white and gray birch, red maple, thorn apple, alders and white pine claim light and moisture while the older stands are slowly maturing into a climax forest of Northern Hardwoods: maple, ash, yellow birch and black cherry. You will also encounter many variations of grasses and shrubs while exploring the Farm landscape, including a great diversity of wetland plants and wild flowers. If travel on our trail system even 700 feet from the Farm, will discover a 40-foot waterfall and a rushing mountain brook below. What constitutes a miracle? These simple pathways in the mountains! The Camel's Hump Nordic Ski Center maintains a network of trails that are well-drained, contoured and graded in a manner that allows skiers to balance speed with control on the downhill, while gliding through the remarkable diversity of the surrounding woodlands and meadows on more gentle terrain. 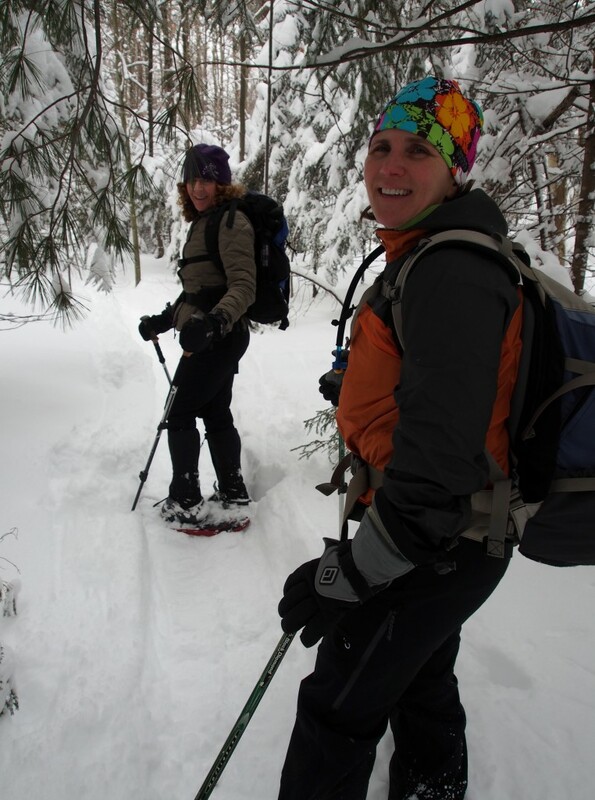 Another 10 kilometers are backcountry trails that climb to the high mountain areas above the farm and adjacent to Camel's Hump. The Best Story in these mountains is the one is that has been playing out for more than 35 years. It’s a story about neighbor helping neighbors and collectively creating a 25-mile network of Nordic, and hiking trails. An all-volunteer Board of Directors was formed to keep this sprawling network maintained and groomed day after day for hundreds of skiers each winter. This happens because of the visionary leadership of Dave Brautigam, who is the Ray Kinsella (in “Field of Dreams”) of these Mountains. It also happens because there is a deep commitment by many in our community to insure that Nordic recreation, in these mountains, is available to others. 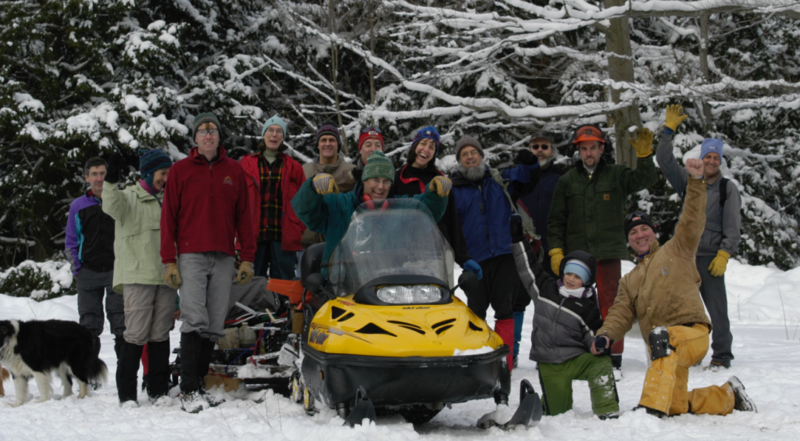 Many, with chain saws and shovels in hand, join David’s army to keep the trails open, drained and groomed.